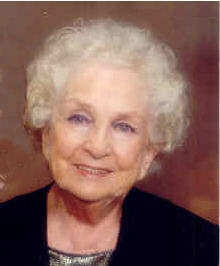 Marie H. Blood, niece of Harry and Bess Houdini, passed away peacefully on Tuesday evening November 2nd, 2004. She had been ill for the past 2 months and then contracted pneumonia. She will be missed by all who knew her. In lieu of flowers the family has established a foundation in Marie's honor called the "Houdini Family Young Magicians Foundation" (HFYMF). The purpose is to assist young magicians pursue their interest in magic. Tax deductible donations may be made payable to the "S.A.M. 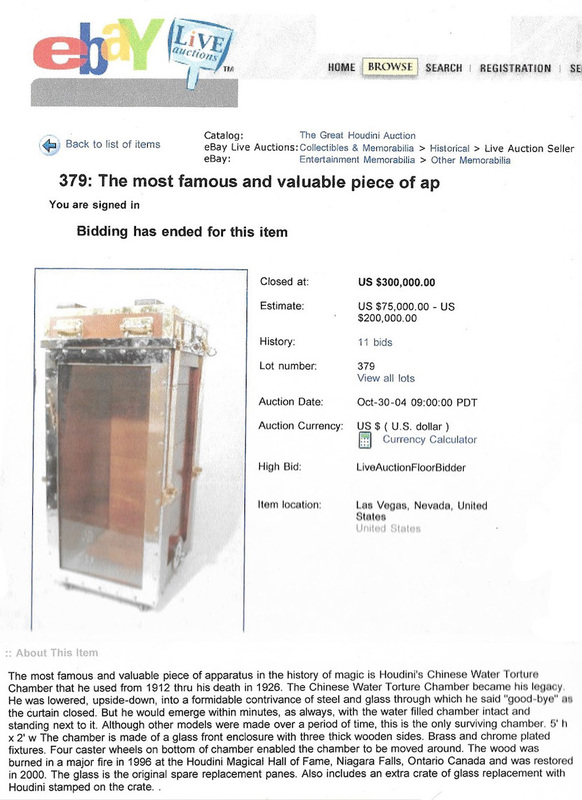 Magic Endowment Fund", Attention: Donation to HFYMF, 234 Town Court, Lower Gwynedd, PA 19002"
Houdini's restored Water Torture Cell sold for $300,000 at "The Great Houdini Auction" held at the Liberace Museum in Las Vegas on October 30. The auction sold off the vast majority of the Sidney Radner collection. The USD was the auction highlight with an estimate of $75,000-$200,000. Below is the auction page as it appeared on eBay. The $300,000 bid was the highest price ever paid for a piece of magic apparatus. The buyer was David Copperfield. Copperfield also acquired Houdini's Milk Can for $35,000 and Houdini's Iron Maiden for $65,000. UPDATE: It appears irregularities with the bidding and an undisclosed reserve resulted in a settlement of the final sale price at $150,000. The following article appeared in The New York York Times on October 29, 2004. LAS VEGAS, Oct. 26 - In a windowless room behind the snack bar at the Liberace Museum, an elderly man with a thousand magic tricks up his sleeve could pocket $1 million or more this weekend. But the man, Sidney H. Radner, a retired rug salesman from Holyoke, Mass., is awfully downcast for someone of good fortune. His eyes, set deep behind wire-rimmed spectacles, invite sympathy, not envy. "My wife just says, 'Take the money and run,"' said Mr. Radner, who is 84. "But I have such mixed emotions about it all." Mr. Radner, aka Rendar the Magician, owns one of the world's biggest and most valuable collections of Harry Houdini artifacts, including the Chinese Water Torture Cell, one of Houdini's signature props from 1912 until his death in 1926. Most of the items were given to Mr. Radner in the 1940's by Houdini's brother, another escape artist who went by the stage name Hardeen. Hardeen considered Mr. Radner, then a student at Yale with a reputation for jumping from diving boards in handcuffs, as his protégé. Until early this year, the collection was on display at the Outagamie Museum in Appleton, Wis., where Houdini's father was the town rabbi in the 1870's. But after a rancorous falling out between Mr. Radner and museum officials, the 1,000-piece collection was packed up and shipped here, where it will be auctioned on Saturday in the windowless back room at the Liberace Museum and on eBay. "Sid is very sad about it," said Jane Merrill of Capital Recovery Group, the auctioneers. "He really wanted it in a museum." The sale, being promoted with true Houdini hyperbole, is the buzz of the magic world. Auction materials quote a 1942 letter from Hardeen, in which he described Mr. Radner as owning "the greatest collection of Houdini material of anyone in the world." Mr. Radner says it is worth perhaps $4 million. The auctioneers set the value at $2 million. When in Appleton, the collection was insured for $1 million. David Copperfield has inquired about several pieces, Ms. Merrill said. Lance Burton stopped by the Liberace Museum this week to be filmed by the History Channel escaping from one of the Houdini straightjackets. A 94-year-old woman from New Jersey, Dorothy Young, who Mr. Radner said was the last living person to have performed with Houdini, is scheduled to arrive here this weekend. "Houdini is still the most recognized name in magic," Mr. Burton said. "It is very exciting to have all of his stuff here." Beneath the excitement, though, are anger, resentment and disbelief that the artifacts, kept together for nearly eight decades by Hardeen and then Mr. Radner, will be dispersed, perhaps never to be in one place again. Sometime past midnight on the morning after the auction, Mr. Radner will convene a séance, as he does every year on Halloween, to mark the day that Houdini died. This time he will do so with an unusually heavy and conflicted heart, he said. Mr. Radner blames the Outagamie Museum, and in particular its executive director, Terry Bergen, for the turn of events. Though saddened to see the collection broken up, Ms. Bergen said the outcome reflected the "very little common ground" that exists between "the entertainment world and the museum world." "Houdini lived here four years and his story is interesting, but there is a whole lot of other stuff that has gone on in Appleton," Ms. Bergen said in a telephone interview. "Our county funding had been cut by 35 percent. It was just ruinous for us. We had to cut a lot of things." Mr. Radner said he was interested in working out a deal, and had even included a provision in his will that would have given the collection to the museum after he and other members of his immediate family had died. But if there was ever hope of a compromise, it was crushed when the museum opened a new interactive exhibit on Houdini in June. 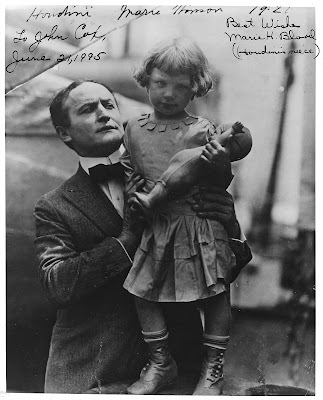 The exhibit, intended for children, reveals how Houdini pulled off one of his most storied illusions, known as Metamorphosis, in which he was placed inside a trunk that was locked by his assistant. Houdini managed to get out of the trunk and switch places with the assistant. Ms. Bergen said the exhibit was a huge success, both in drawing visitors to the museum and in creating interest in Houdini and his magic. But the exhibit infuriated Mr. Radner and many other magicians, who protested that the museum had broken the magician's code by revealing the secret. Ms. Bergen, who explained to Mr. Radner that the trick was widely available on the Internet and in libraries, said she nonetheless was bombarded with complaints from "a small but angry" group of magicians who branded her the "Houdini betrayer." "The stink over the Metamorphosis was part of the stink over us not renewing the lease," Ms. Bergen said. "It would not have happened if we hadn't made Sid mad and other people mad." Geno Munari, a friend of Mr. Radner who owns a chain of Houdini magic shops, including several here in Las Vegas, said the Appleton museum had taken advantage of Mr. Radner's generosity. By Mr. Radner's reckoning, he had donated $750,000 worth of artifacts to the museum over the 15 years. Now, Mr. Munari said, the museum figures it can get along without him and his collection. The ultimate act of selfishness -- and disrespect -- was exposing the illusion, Mr. Munari said. The ill feelings have persisted. Ms. Bergen recently had a lawyer remind Mr. Radner that he could not use museum stationery to promote his collection. Though Mr. Radner was a founder of the Houdini Historical Center, a division of the Outagamie County Historical Society, which operates the museum, Ms. Bergen said it was inappropriate for the letterhead of a nonprofit group to be used for commercial purposes. Mr. Radner said this week that he would not rest until he had removed the Houdini Historical Center from the control of the Outagamie County Historical Society and had relocated it far from the grip of Ms. Bergen. "I don't care where it goes, so long as it is not in Appleton," he said. "She doesn't know Houdini from Liberace. She just knows dollars." The curator of the Houdini exhibit in Appleton, Kimberly Louagie, said if Houdini's wishes had been honored, there would be none of the bickering over the collection. As Ms. Louagie tells it, Mr. Radner and his friends might not like what they hear should Houdini reveal himself at the séance on Halloween. "According to his will, he wanted it destroyed," she said. "I would suspect that he doesn't like the fact it is out there at all." UPDATE: Houdini's Water Torture Cell sells at auction. BBC News reports on the controversy over the Houdini Historical Society's "AKA Houdini" exhibition in Appleton, Wisconsin. 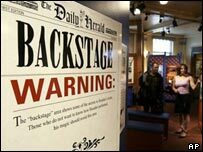 The AKA Houdini exhibit warns visitors that secrets are revealed Magicians have protested against a new exhibit in a Wisconsin museum giving away the secret to one of illusionist Harry Houdini's most famous tricks. The exhibit at the Outagamie Museum in Appleton, Wisconsin shows how Houdini performed his "Metamorphosis" trick. In the illusion Houdini - supposedly handcuffed in a sack and locked in a trunk - miraculously switched places with an assistant on the outside. Some members of the Magic Circle have been angered by the museum's decision. Illusionist David Copperfield has reportedly expressed his disapproval, along with lesser-known practitioners of the craft. "This is a very, very passionate thing that magicians feel about," said Ronald "Rondini" Lindberg. "What the museum is doing is wrong." However, curator Kimberley Louagie defended the museum's actions. "We didn't feel like we were exposing anything, because this information is readily available," she said. "By telling people how this trick works, we're giving people a deeper meaning of Houdini." Teller, one half of magical duo Penn and Teller, said people who see the Houdini exhibition would still be baffled if they watched a similar trick being performed at a show. The AKA Houdini exhibit features 38 artefacts, 190 documents and "hands-on" displays that include handcuffs, lock picks, a straitjacket and a jail cell. The part of the exhibit that shows how tricks are actually performed is in a backstage area. The entrance bears a sign warning visitors not to enter if they do not want to know how Houdini achieved his baffling illusions. Houdini was born Ehrich Weiss in 1874 in Budapest, Hungary. His family moved to Appleton when he was four and stayed four years. He died on 31 October 1926 - Halloween - of a ruptured appendix.